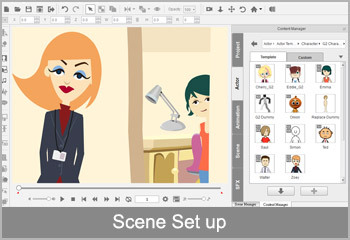 Complete 2D animation editing environment with categorized movie elements: Actor, Animation, Scene and Special Effects. In-screen object Editing Gizmo (select, transform, opacity, link, flip) and Navigation (camera zoom, pan, rotate) Tool Sets. Two Editing Engines: Composer Mode for character and prop set up, and Stage Mode for animation editing. 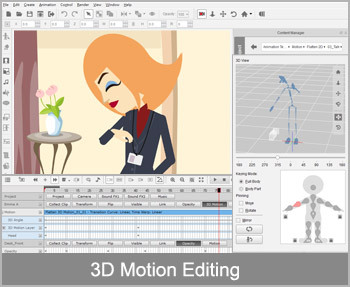 Full editing environment for Actor, Animation, Scene and Special Effects; each with its corresponding content libraries. Group concept categorizing (e.g. 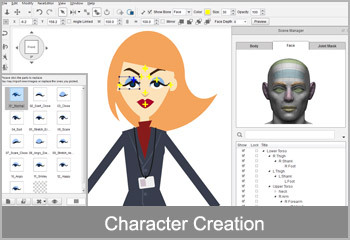 Perform = Face motion + body motion; Character = Head + Body) for quick file access and management. Flexible user interface lets you detach, move and dock panels to customize your own layout and working style. New workspaces allow you to simultaneously work on two screens. Optimize your layouts for different working scenarios like; scene setup, character creation, or animation editing. 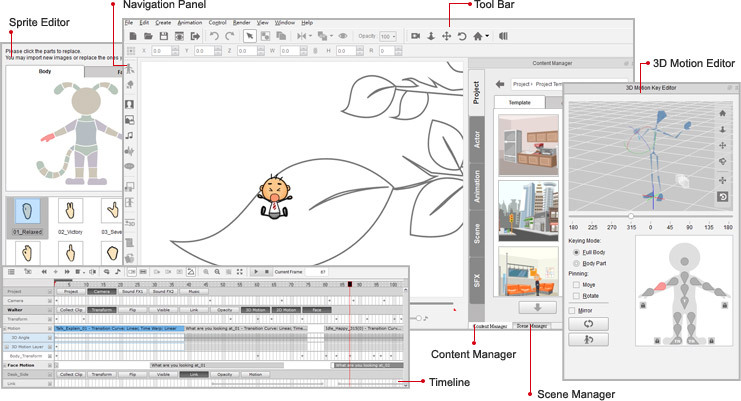 Drag any media* (images, videos, flash, sprite video) files from the content manager, or any external drive, and drop them directly into the animation stage. 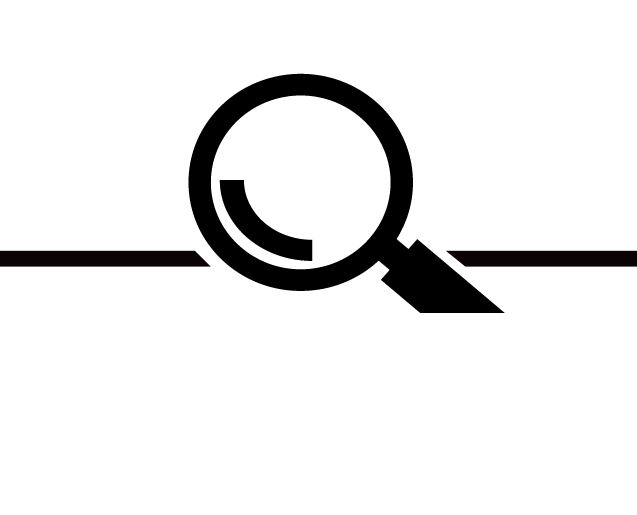 Import popular media files such as images (.jpg, .png...), videos (.avi, .wmv...), flash files (.swf) and transparent video sprites (.popVideo) that are compatible with the original creation tools. 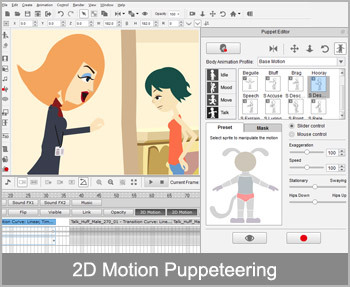 *CrazyTalk Animator 2 Mac Version does not support video media import through drag & drop or other methods. Use the Preview Camera to review scenes, and the Live Camera to animate camera positions with key frames. Customize camera views with the pan, rotate and zoom tools. Quickly switch between Perspective and Orthographic views for a 3D or 2D sensation. 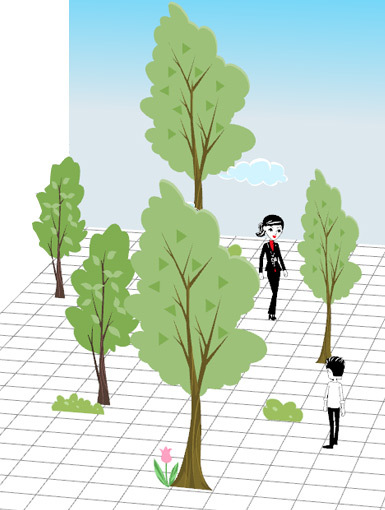 Navigate scenes in Perspective mode to experience realistic 3D camera movements. Set keys in the Playback Panel for quick animation control. Create path anchors in different time frames for character and object motions. Customize path anchors with position adjustments and speed control. Freely control facing and fade in/out by using the Flip and Transparency features. Hold and move any element with the link/unlink features. Quickly adjust your project’s output size/ frame and aspect ratio before rendering and final export . Current frame render button helps users instantly preview their projects. Move, Copy, and Paste keys-extend, loop and group motion clips together. Key frame editing for opacity, transform, visibility, link, path animation, sprite switching and flipping with blending effects. Motion Layering allows layer additions over existing motions. Flexibility to use main track for quick key management, and sub tracks for detailed joint movements. 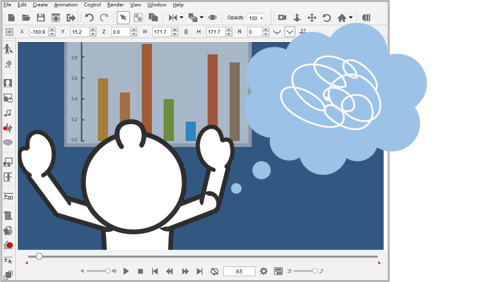 Animate body motion tracks with up to 16 individual body segments. Facial motion tracks that are divided into voice scripts, morph and sprite-based categories. 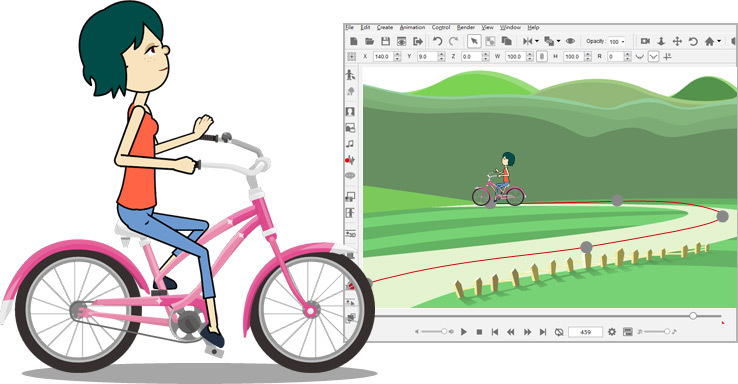 Create cartoon style animations with motion curve, time warp and motion clip blending.